Letting Space public art organisation has appointed well known designer Tamsin Cooper to become the broker for creative projects and empty commercial sites through the Urban Dream Brokerage, Dunedin from this week. 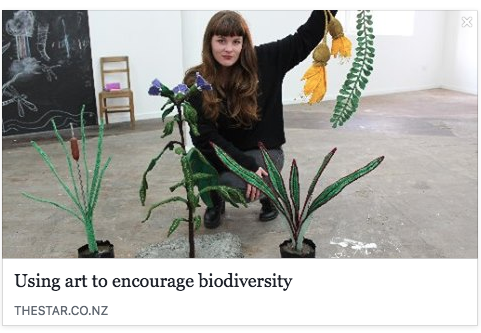 Cooper has run her own international fashion label, Tamsin Cooper, and is known to the arts community through being the Community Arts Advisor for Dunedin in the late 1990s. She will continue to keep her fashion interests alongside the part time broker role. The Urban Dream Brokerage service has been running in Wellington for 3 years and brokered 36 projects in this time. In Dunedin the service is funded from Ara Toi Otepoti – Our Creative Future, Dunedin’s Arts and Culture Strategy. The service will be seeking engaging projects and willing landlords this month. “Dunedin has a strong history of collaborative partnerships and urban revitalisation and it’s great to be able to speed up the connections through this pilot brokerage,” says Sophie Jerram. People with ideas for projects should consider how their ideas open and enliven public space when proposing themes. Ideas are considered by a panel consisting of artistic, academic, and property interests.